In this age of Big Data and analytics, knowledge gained through experiential learning and intuition may be taking a back seat to analytics. However, the use of intuition should not be underestimated and should play an important role in the decision process. How Well Do Executives Trust Their Intuition covers the Fulbright research study conducted by this international team of editors. The main question of their investigation is: How well do executives trust their intuition? In other words, do they typically prefer intuition over analysis and analytics. And equally importantly, what types of intuition may be most favorable looking at different variables? The research utilizes survey and biometrics approaches with C-level executives from Canada, U.S., Poland, and Italy. In addition, the book contains chapters from leading executives in industry, academia, and government. Their insights provide examples of how their intuition enabled key decisions that they made. The book explores how executives can use intuition to guide decision making. 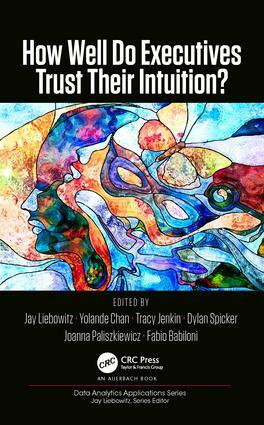 It also explains how to trust intuition-based decisions. How Well Do Executives Trust Their Intuition is a timely and prescient reminder in this age of data-driven analytics that human insight, instinct, and intuition should also play key roles. Dr. Jay Liebowitz is the Distinguished Chair of Applied Business and Finance at Harrisburg University of Science and Technology. He previously was the Orkand Endowed Chair of Management and Technology in the Graduate School at the University of Maryland University College (UMUC). He served as a Professor in the Carey Business School at Johns Hopkins University. Dr. Yolande E. Chan is Associate Dean (Research and Ph.D./M.Sc. Programs) and E. Marie Shantz Professor of IT Management at the Stephen J.R. Smith School of Business at Queen’s University. She holds a Ph.D. from Ivey Business School, an M.Phil. in Management Studies from Oxford University, and S.M. and S.B. degrees in Electrical Engineering and Computer Science from MIT. She is a Rhodes Scholar. Prior to joining Queen's University, Dr. Chan worked with Andersen Consulting (now Accenture) in Toronto, Canada.Dr. Tracy Jenkin is an Associate Professor at the Smith School of Business at Queen’s University, where she received her PhD in Management Information Systems. Her research explores innovation and learning in the areas of environmental sustainability and IT (green IT), project management, project alignment, and data mining. Dylan Spicker is a graduate of the Smith School of Business at Queen’s University. He is the key person involved with IBM Watson at Smith, and works in the Scotiabank Centre of Customer Analytics at Queen’s. He is entering his MS/PhD-Statistics program at the University of Waterloo. Dr. Joanna Paliszkiewicz is a Professor at Warsaw University of Life Sciences in Poland. Her multiple research writings were published in scholarly outlets including a book entitled "Development of organization by management of intellectual capital". In 2006, she moved from Czestochowa to Warsaw to start employment at Warsaw University of Life Sciences where she was conducting research in the area of knowledge management. In 2009, she earned her habilitation degree. Dr. Fabio Babiloni earned his master degree in Electronic Engineering at the University of Rome "La Sapienza" and the PhD in Computational Engineering at the Helsinki University of Technology, Helsinki in 2000 with a dissertation on the multimodal integration of EEG and fMRI. He is currently Associate Professor of Human Physiology at the Faculty of Medicine of the University of Rome "La Sapienza", Rome, Italy. He is the author of more than 120 papers on bioengineering and neurophysiological topics on international peer-reviewed scientific journals, and more than 250 contributions to conferences and books chapter.